I think my former Wall Street colleagues know this without the need to read a chart. I added Sufi and Mian’s blog to the economics blogroll on the right after seeing the CFA Institute’s webcast of Sufi’s presentation at a conference at the University of Chicago. Sufi also projected a slide showing that GDP growth has fallen far off trend and is getting worse, not better. 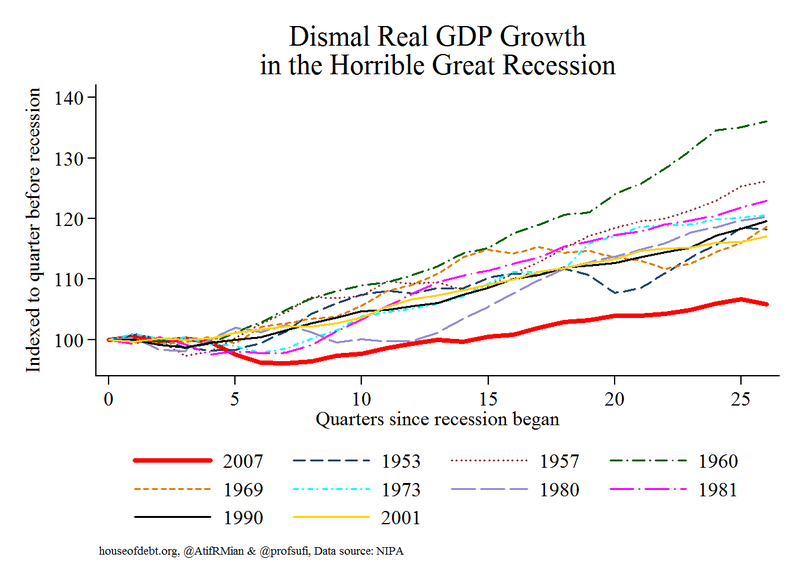 Normally, GDP catches up to long-run trends after a few years of recovery. I usually have a negative knee-jerk reaction to anyone who says “it’s different this time” and true to form, I disagree with Sufi’s argument that capital can replace labor completely. His is a Luddite argument that has been made since the industrial revolution and never materialized. Capital can only replace labor when (if?) we reach the Singularity and machines can reproduce themselves. (By machines, I mean both mechanical and electronic.) Until then, back-breaking labor will be replaced by machines that, in order to propagate, will need engineers and programmers and maintenance workers and chip makers, and entrepreneurs who can employ machines in purposeful activity, etc. That reminds me; I also added Ray Kurzweil’s website to the blogroll. This entry was posted in Uncategorized and tagged Amir Sufi, Atif Mian, CFA, CFA Institute, Chartered Financial Analyst, Competition and Strategy, Debt Crisis, Free Markets, House of Debt, Housing Bust, Invisible Hand, Quantitative Easing, Ray Kurzweil, Risk, Singularity, The Rational Optimist, Worst Recovery in History. Bookmark the permalink.